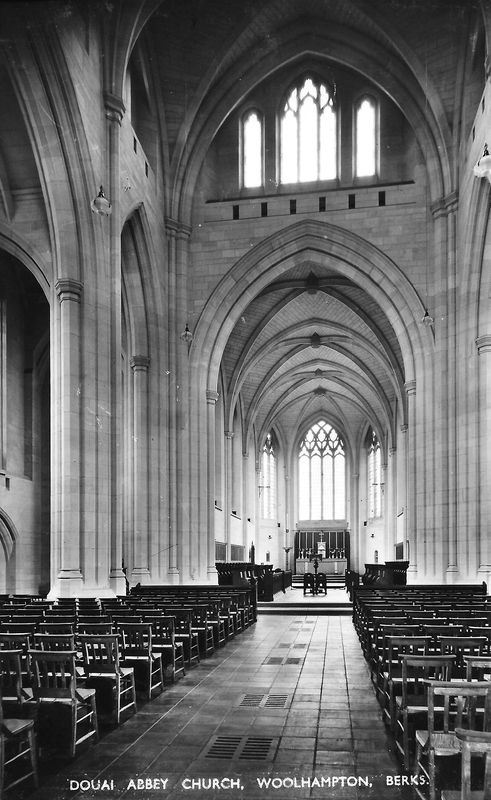 Over at the New Liturgical Movement one can find a rich resource for charting the changes that liturgical reform has brought to church architecture and liturgical vestments. Very few churches go through life without being modified in some way to meet new circumstances, or as a result of war or disaster. Some changes are good; some are woeful. Even Douai Abbey‘s relatively young and humble abbey church has seen a good deal of change, nearly all of it before my arrival here. Nevertheless our photo archive affords a glimpse into the changes that have been made to our church in its near 80 years of existence. It fascinated me, and perhaps some others will find the photos of interest. They will enlarge on being clicked. 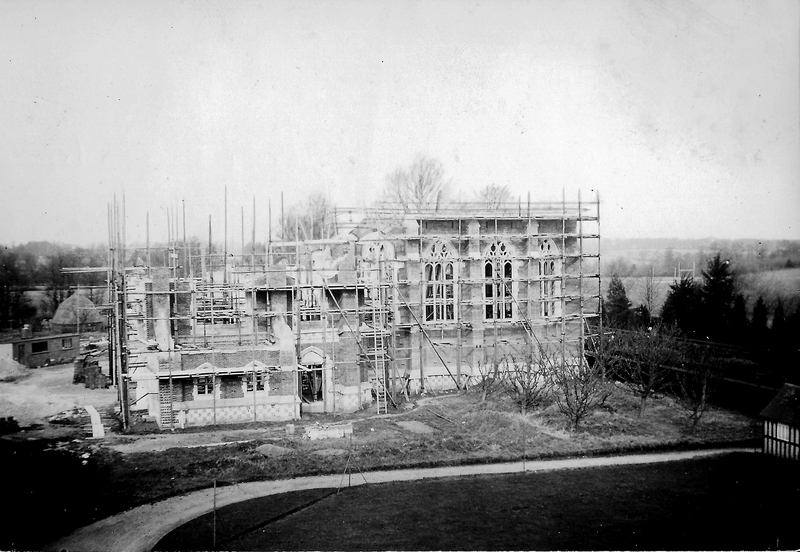 Construction circa 1929, seen from the top floor of the then monastery block, the Ark, later to become a dormitory for the school. 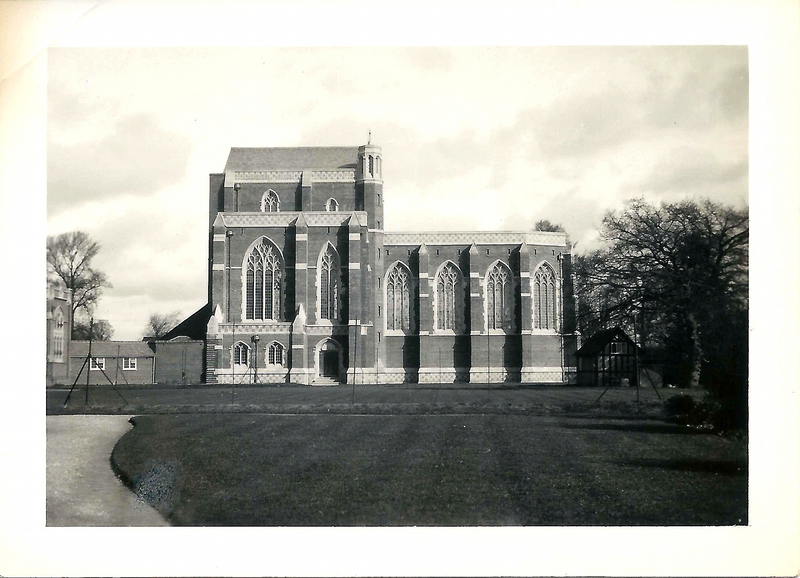 The church was designed by Arnold Crush (1885-1936), a convert from Birmingham, and a pupil of Sir Giles Gilbert Scott. 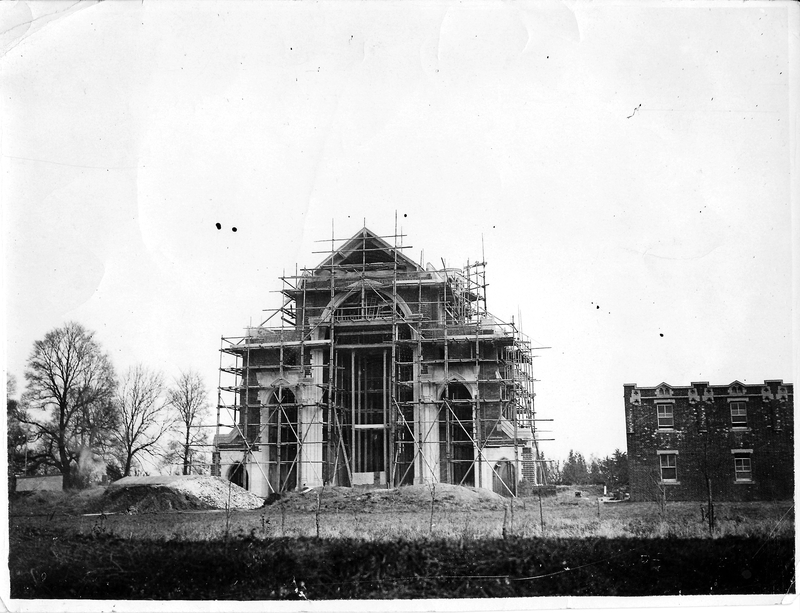 The west end of the abbey church under construction, with what was originally intended as the chapter house on the right. 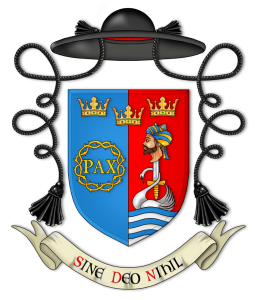 In the event it was for a time the novitiate, and now houses the sacristy, some offices and some guest rooms. 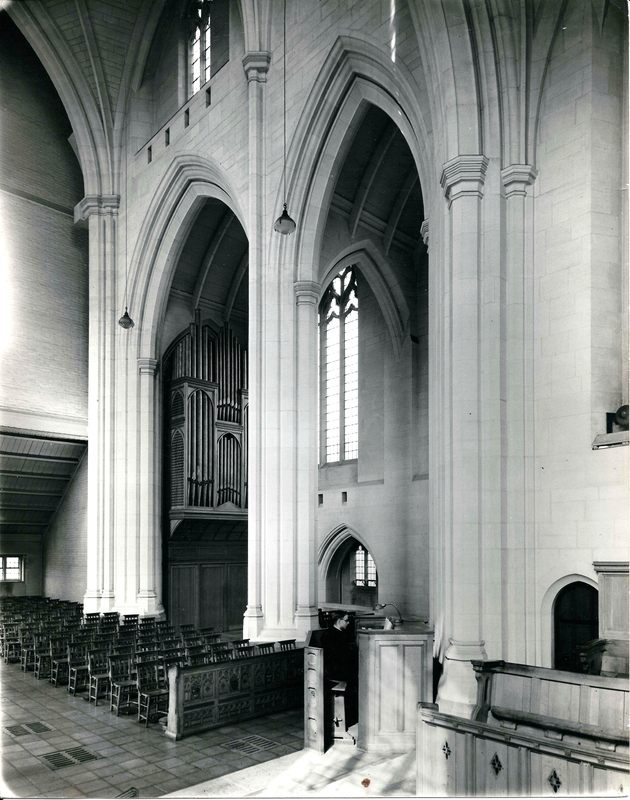 The abbey church in the year of its opening, 1933. The original plan was not completed due to lack of funds. It was to be a very large church in red-brick Decorated Gothic. What was built here was meant to be the lady chapel and chancel. A temporary west end was built, which became semi-permanent, remaining 60 years. This represents only one-third of Crush’s design, as much as was ever built. The abbey church and its ‘temporary’ west end, seen through the monastery gates. The Ark, at this time the monastery, can be seen at far right. 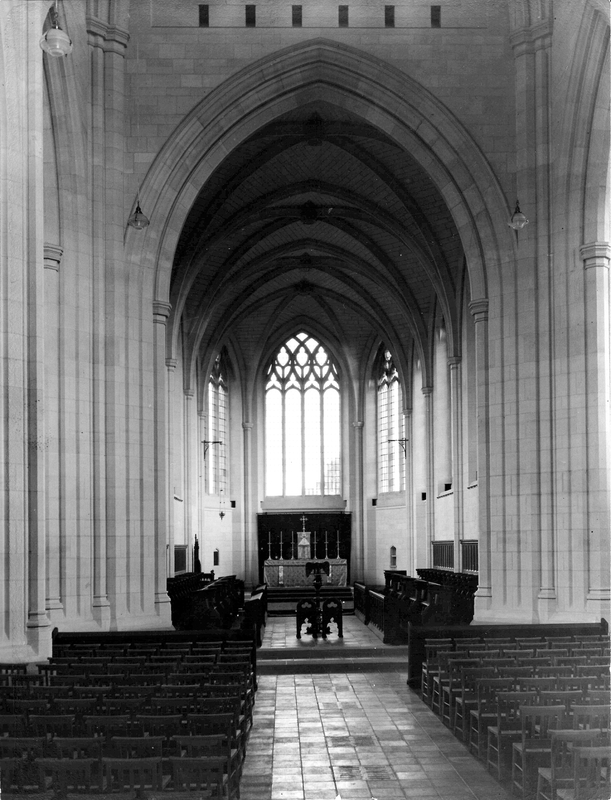 The interior of the abbey church prior to some minor renovation in 1952. The choir stalls are still in use, the eagle-ambo long gone, and the cantors’ stools, relics from old Douai, now elsewhere in the monastery. The seating for the boys seems rather attractive to me; if only we still had those seats. 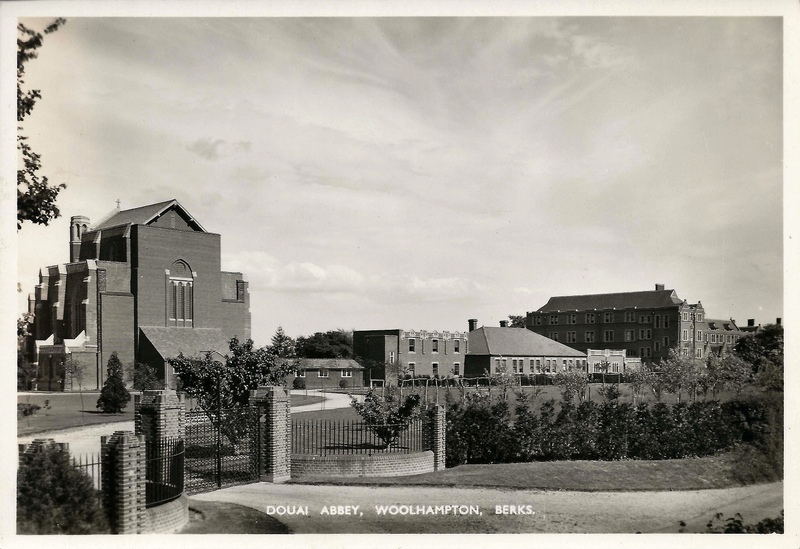 A postcard view of the abbey church prior to 1952. Its current Grade II* listing is in no small way due to the church being an early example of the innovation of structural stone-clad concrete. A closer view of the pre-1952 altar, with its lovely sanctuary carpet. 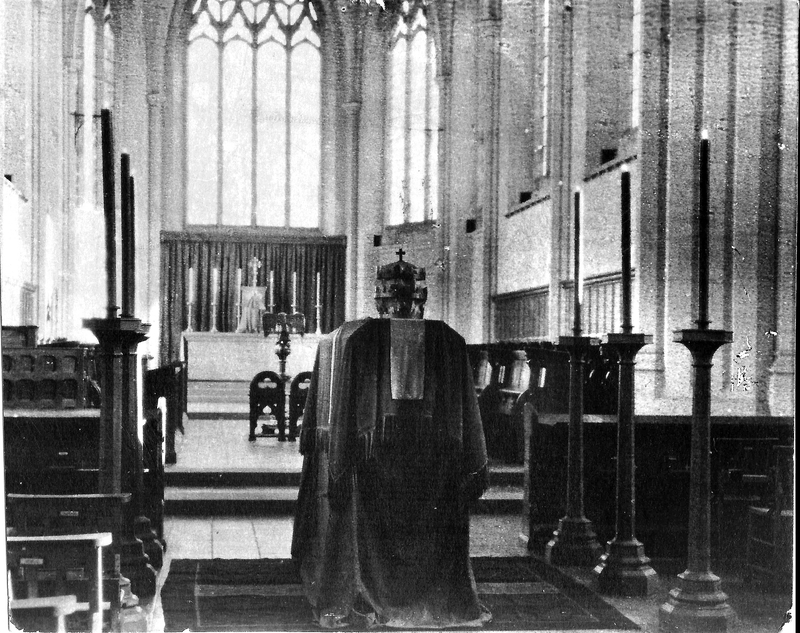 The postcard entitles it the Lady Altar, a nod to the fact that this area, though used as the choir and sanctuary, was intended as the Lady Chapel. 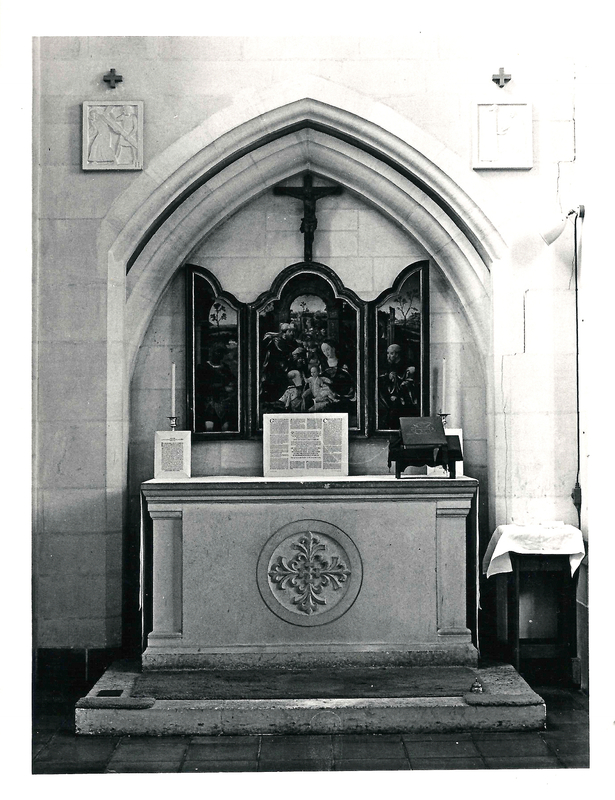 Until 1978 this was the principal altar of the church. 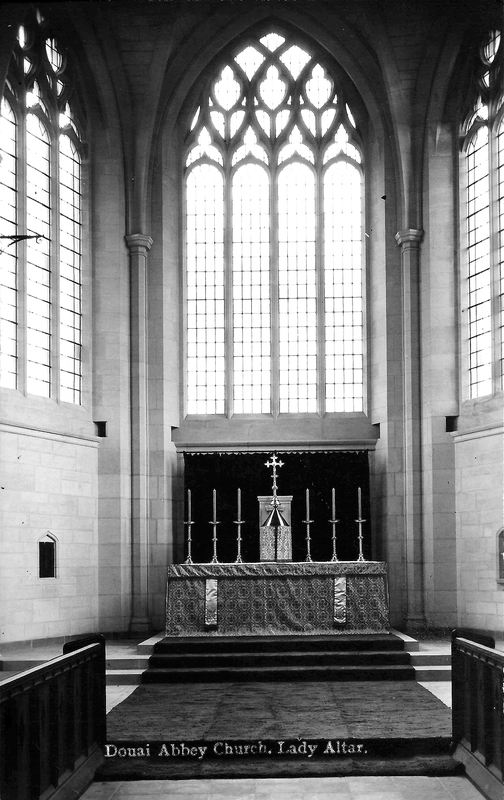 In what is now the Blessed Sacrament Chapel was the St Benedict Chapel. 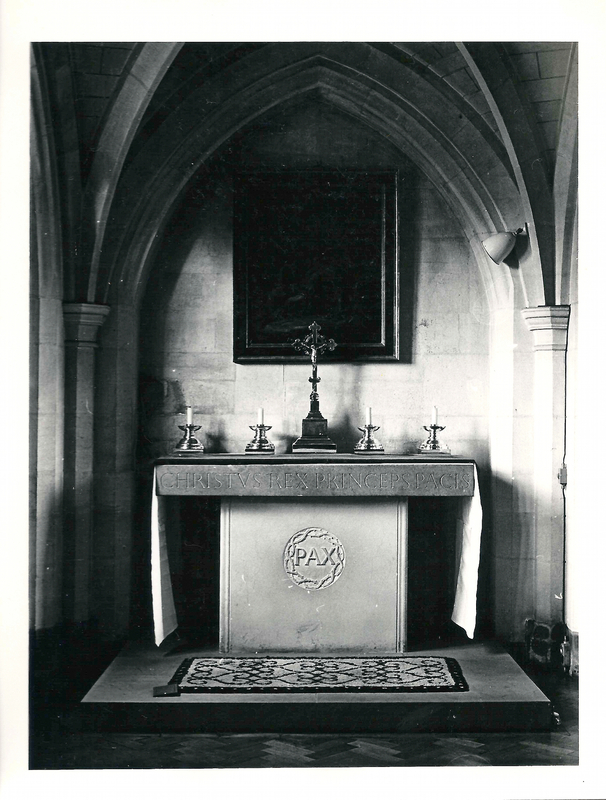 The simple yet elegant altar remains to this day, with fine lettering by Christopher Derrick. The squat candlesticks we still use today on the main altar. Between the St Benedict Chapel and the entrance to the choir was the altar of St Joseph. Now long gone, victim to the reforming zeal for one altar only in a church, the area today is behind the new Tickell organ and is a chair store. The triptych is now rather awkwardly placed in the sacristy for the house chapel. A poor quality photo showing the church arrayed for a Requiem offered on the death of Pope Pius XI in 1939. Note the unbleached candles and the papal tiara (made of cardboard I believe!). In time the church was equipped with the first of its organs. Here is a shot with a young Fr Romuald (+2012 – RIP) tickling the keys. Part 2 to come in due course. Pax! 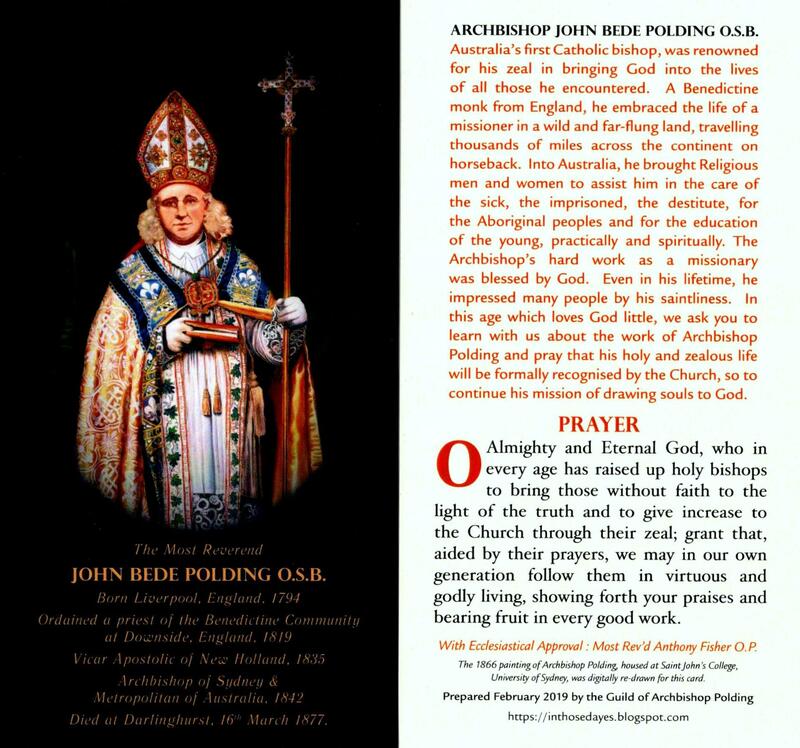 Next Post Bishop Williamson – off the deep end. Thank you for the latest addition to your blog. I would be grateful if you could keep two actually three former classmates in your prayers. Michael Fitzgerald’s life is hanging by a thread. He has liver cancer and is in the ICU of RNS and he has reached the end of his tether according to his wife Marianne and they have disconnected all his tubes etc. John Liddy who was my right hand for our reunion and who drafted and printed the beautiful mass books, wrote the most beautiful prayers of the faithful as well as play the organ has just been diagnosed with Stage IV colon cancer with secondaries in the lungs, liver and most likely pancreas and spine. He said he noticed something and maybe should have had a check-up and the colonoscopy last week revealed the bad news. I have just booked in for my 3rd colonoscopy for November. I am just so shocked by John’s news we have become good mates over the last 2 years. Steve Wiblin is now battling lymphoma but of a type that cam be treated successfully they say. He has also had bowel cancer. How are things with you? I enjoy reading your blog regularly. What a welter of bad news. I shall offer Mass this morning for Michael, John and Steve. When cancer hits it really hits. At the moment my insignificant hassle is coping with the cold snap here. This was preceded by a numbers of foggy days, but it is the seasons of mists and mellow fruitfulness, so to be expected! I really like the noble austerity of the Altar of St Joesph. Indeed it is a lovely altar. And I have recently discovered that it is not lost, but stored in our cellar. You are supplying me with information I should perhaps have researched myself when doing my QI reports… I didn’t know the walls were also concrete behind the stone and brick cladding. That explains the pattern of regular cracking around the Sanctuary which I have noted. When I am most helpful if is usually unwittingly!